There are many reasons to love San Francisco. The culture, the architecture, the history and diversity – it’s safe to say there are not many places that hold a candle to the uncommon energy that makes the city so magical. Located along the waters of this historic San Francisco Bay, the vibe at Ferry Plaza Farmers Market makes no exception. Here, thousands of locals come every week to seek out the freshest California produce, enjoy the scenic views, and bask in the company of community and culture. FMC is thrilled to have Ferry Plaza FM as our next Guest Instagrammers and caught up with Communications Manager, Brie Mazurek to learn more! Don’t forget to jump on over to Instagram and discover the magic for yourself! Farmers Market Coalition: Give us some background on Ferry Plaza Farmers Market. Brie Mazurek: Following the 1989 Lloma Prieta earthquake, the large freeway that ran in front of San Francisco’s historic Ferry Building buckled and had to be removed. In 1993, many passionate farmers, chefs, and food lovers came together to reclaim and reactivate that space by starting the Ferry Plaza Farmers Market. The nonprofit Center for Urban Education about Sustainable Agriculture (CUESA) was founded in 1995 with a mission to cultivate a sustainable food system by operating the farmers market and educational programs that connect urban dwellers with our local foodshed. 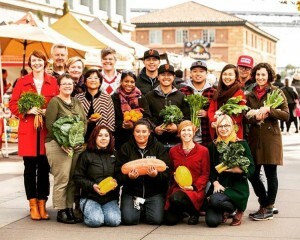 Our markets and programs are run by CUESA’s full- and part-time staff and our dedicated volunteers. Today, at peak season, we have close to 110 vendors, some of whom have been part of the market since day one. We are a California Certified Farmers Market. All of our producers are from California–most of them within a 100 mile radius of San Francisco–and all of our farmers grow what they sell. More than half of our farmers are certified organic, and all of them have signed a pledge to work toward a healthy food system. FMC: What does a typical day look like at Ferry Plaza FM? BM: Located on the beautiful Embarcadero waterfront, we’re an outdoor market featuring a variety of locally grown produce, meat, seafood, food craft products, baked goods, and hot prepared foods. We’re proud to call the iconic Ferry Building our home, and we have strong ties with the indoor marketplace, which started in 2003. Many of the indoor businesses, like Blue Bottle Coffee and Cowgirl Creamery, have grown up in our farmers market and graduated to brick-and-mortar retail shops and restaurants inside the Ferry Building. The Ferry Plaza Farmers Market operates year-round, rain or shine, on Saturdays (8 am to 2 pm) and Tuesdays and Thursdays (10 am to 2 pm), and the Ferry Building is open seven days a week. Tens of thousands of people visit us each week, and more than 300 restaurants source from our farmers market. FMC: How does Ferry Plaza FM support and excite the surrounding community? BM: CUESA hosts a wide variety of educational programs, including free cooking demos, hands-on kitchen skills classes, farm tours, and evening talks to engage people in issues around food and sustainability. We host two youth programs, Foodwise Kids (a free farmers market field trip and cooking class for elementary school students) and Schoolyard to Market (a semester-long school garden and youth entrepreneurship for high school students). We also offer Market Match, which doubles the food dollars for shoppers who use EBT at our farmers markets. In addition to our farmers market programming, several times a year we host evening parties and fundraisers inside the Ferry Building, like our upcoming Spring Cocktails of the Farmers Market event (April 27). And right now we’re busy gearing up for our annual Goat Festival (April 16), where San Franciscans will get to learn about the wonders of goats, taste artisan goat products, and pet baby goats at the farmers market! FMC: What are some of Ferry Plaza FM’s challenges and successes? BM: The Bay Area is constantly in flux, and right now we’re undergoing a huge demographic change with the tech boom. We are constantly looking for ways to bring new people to the farmers market, improve access and affordability, and engage eaters of all ages in local food. Being in this epicenter of good food has pushed us to stay on top of the trends, and our dedicated and talented farmers, food crafters, and chefs are always raising the bar of innovation and sustainability. They’re the reason the Ferry Plaza Farmers Market has been such a beloved destination for locals and visitors alike over the years. FMC: What makes Ferry Plaza a place new and returning locals want to visit? BM: There’s nothing like visiting the Ferry Plaza Farmers Market on an early Saturday morning. The passionate and inviting community, the scenic waterfront setting, and the huge variety of fresh produce and delicious food products is incredible. We have shoppers who have been coming to the market for more than 20 years and who call it their church. Right now, you’ll see some of the country’s top chefs loading up their carts with bags of lush greens and flats of strawberries, alongside families with kids who may be tasting spring peas for the first time. There is always something new to taste and discover! Even in this time of drought, we’re blessed to be in Northern California, where we have access to so much bounty year round, and where we’re surrounded so many creative and dedicated farmers and food makers who bring it to market. Head on over to Instagram and follow their story!